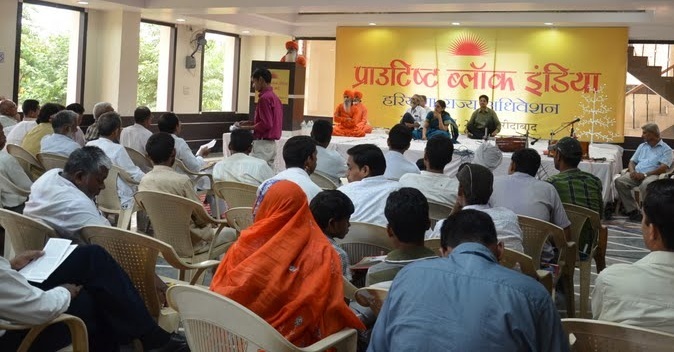 (Delhi, August 29, 2011) – The two days Haryana state convention of Proutist Bloc of India (PBI) at Faridabad, India was attended by representatives of many Indian communities from Haryana, Punjab, Delhi, Orissa and Bihar states. The 200+ delegates discussed proutistic solutions to current social and economic problems and adopted program resolutions and practical strategies for a democratic approach to establishing PROUT. The convention was inspired by powerful presentations on PROUT, the release of Sadvipra Revolution, a new book published by Ac. Santoshananda, and artistic and cultural presentations including a new collection of PROUT revolutionary songs, Viplav Geet, presented by artists on stage and on CD. Speakers included Dr. Jyotsana Jaid, Editor of Light of Nation Magazine, Sh. SC Tyagi, Ac., National Chairman of PBI, Ac. Santoshanand, and leading proutists of the various states.